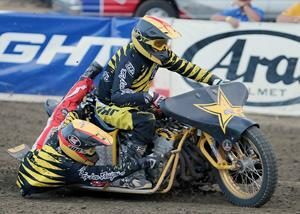 For the fourth time this year the Extreme Sidecars have returned to Auburn to thrill the Fast Friday faithful at the Gold Country Fairgrounds. With a strong fan base in Auburn the Extreme Sidecar teams were greeted to a full house of appreciative Fast Friday’s fans. The sidecars are driven by a pilot and a rider or monkey that hangs on to the back of the three wheeled 1100cc motorcycle swinging from side to side to balance the bike. 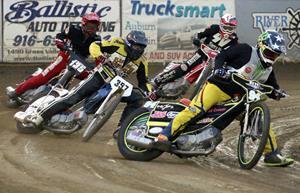 The teams ride in the opposite direction on the track as the speedway riders. It’s very thrilling to watch as the monkey moves from side to side hanging off the bike dragging on the track as the driver steers the bike at high speeds. 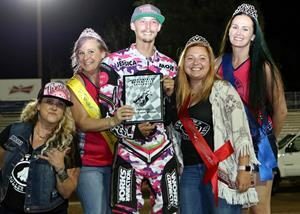 Coming off his first main event win of the Fast Friday’s season last week in the handicap main event, Charlie Venegas followed up this week with a win in the scratch main event for the first time this season. 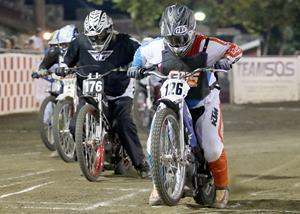 Venegas a veteran with over 25 years of racing experience faced Billy Janniro, Tommy Hedden and Russell Green. Venegas got to inside on turn one ahead of Janniro and the two were locked in a battle. Venegas was able to stay ahead of Janniro for the entire four lap race taking the checkered flag. Janniro was second, Green was third and Hedden fourth. 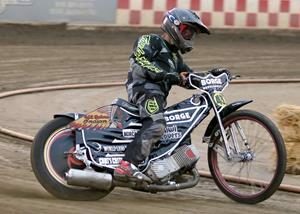 Absent for the main was Bart Bast who along with Hedden were uncharacteristically involved in crashes during the scratch semi-final. Bast was pretty shaken up and unable to continue racing for the rest of the evening. 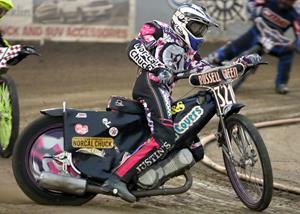 Hedden was involved in two mishaps in the same semi-final but somehow managed a win and transferred to the main. 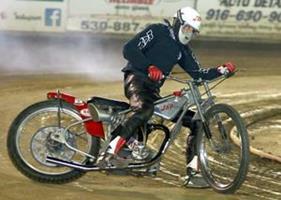 In another season first Fred Cook stood on the winner’s podium as first place finisher in the Division II main event. In a close finish with Shawn Eldredge, Cook had the edge and finished first. Eldredge was second and Sammy Tetrault was third. 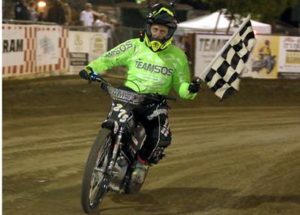 Jake Estes was the king of Division III taking the checkered flag in the main event. Casey Cornilsen was second and Peter Pecorilla was third. 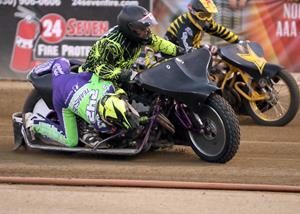 Cameron Krezman and Landon Norton have rode hard against each other each week all season long in the Youth 250cc youth program. Both tough competitors one or the other usually claims the main event. This week is was Krezman for the second week in a row. Each racer won both of their heat races to transfer to the main. 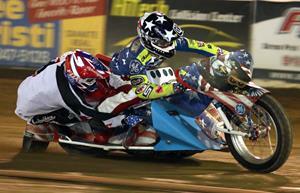 In the Youth 250cc main event, Krezman took the race and was unbeaten for the evening. Norton was second, Anthony Dion was third and Alex Martin was fourth. Landon Collins won the Youth 250cc consolation race followed by Timmy Dion, Dylan Wagner and Kyle Cunningham. Riding really well Colton Nelson took the Youth 150cc main event. Nelson repeated his last week’s win. Nelson split the heat races with Charlie Trana and both transferred to the main. Nelson was first and Trana second. -Fred Cook won the Division II main event. His first main event win of the season. Jake Estes (front) lines up first for a Division III main event restart. Estes went on to win the Division III main event. 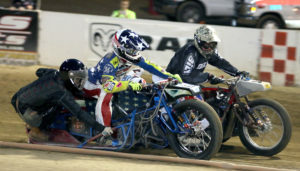 Bryan Motis (front) and Eric Hernandez on their way to the sidecar main event win. 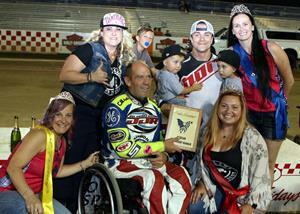 Bryan Motis (holding trophy) and Eric Hernandez (holding his children Jace and Ryder) celebrate their sidecar main event win Friday night. 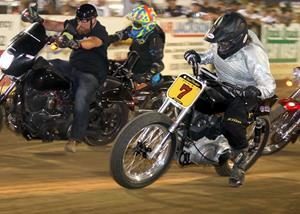 Charlie Venegas followed his handicap main event win last week with a scratch main event win this week at Fast Friday’s.